Shorne Woods Country Park is located just off the A2 near Gravesend in Kent. It was formerly part of the Cobham Hall Estate, but the land was used for clay extraction between the 1930s and 1970s. In 1987 the 288 acre site came under undership of Kent County Council, who subsequently turned it into a country park. 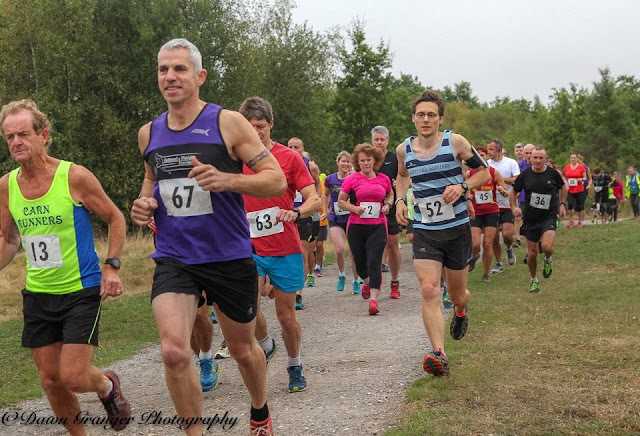 The Shorne Woods 5 was put on in September 2016 as a fundraiser with all money going back into conservation in Kent's country parks. I registered online in advance and paid the £15 entry fee (£12.50 plus £2.50 VAT). The entry fee also included parking in the on-site car park which would usually cost £3 at the weekend. 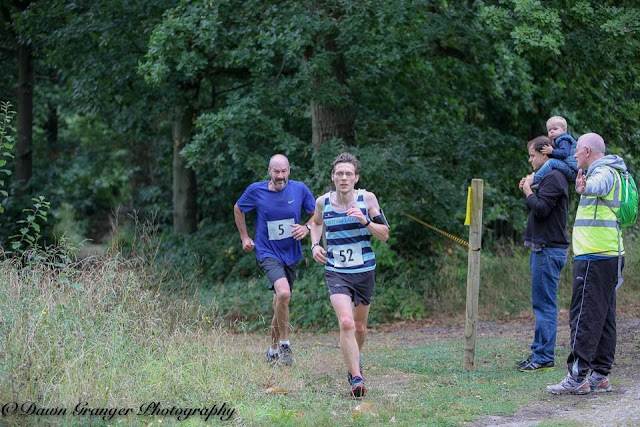 As I understand it, there have been two previous Shorne Woods 5 mile races. However this incarnation of the event was organised by a different set of people and using a different course. So moving onto the day, the race numbers were collected on-the-day from the kiosk next to the car park. This process would have worked better if on-the-day registrants had a separate queue - it would have allowed the pre-registered people to collect their numbers a little more swiftly. There are two sets of toilets available for use in Shorne Woods; the first are at the visitor centre / cafe building and the second are in the kiosk building. Unfortunately the toilets at the cafe stopped working shortly before the start of the race so everyone had to use the smaller facilities at the kiosk, which to be fair wasn't too bad because this was a low-key race with a modest number of runners. 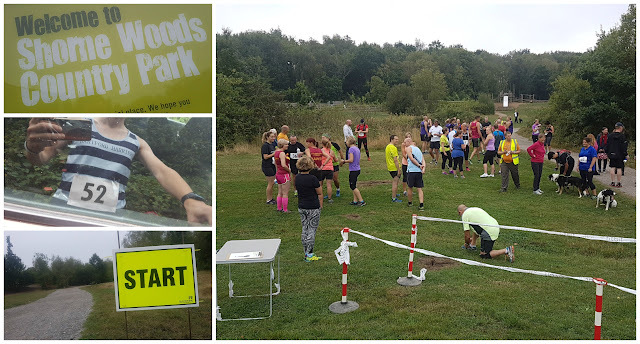 The start and finish of the race was just a few minutes from the car park, near the children's play area and the lake. A short briefing took place at 9.30am and it was then time to get started. At first the course took in some of the hard-packed easy access paths that are used for Shorne Woods parkrun (to date I've visited the parkrun twice, you can read those posts here and here). Once this opening section was complete the runners were sent out into the woods themselves, which is one of the reasons I wanted to run this race. 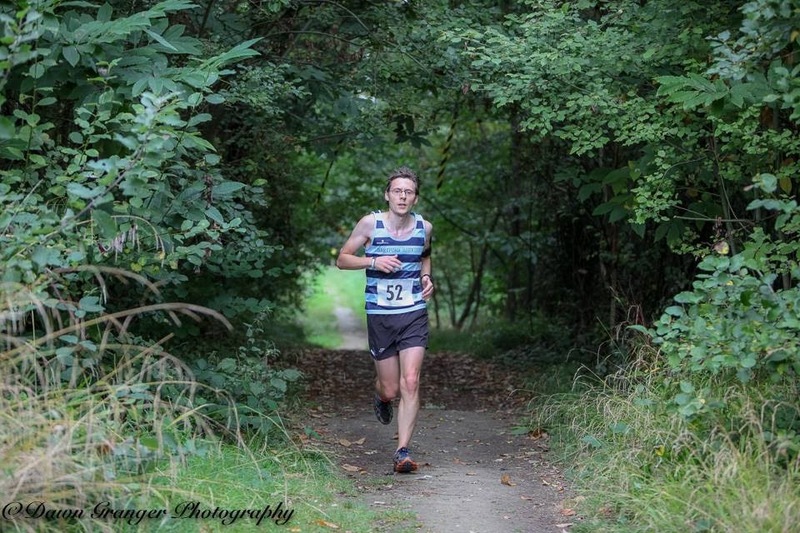 I've run and cycled through Shorne Woods in the past and it is a great place to get in some off-road action. It's also a great place to get the legs used to running off-road again in advance of the cross-country season. 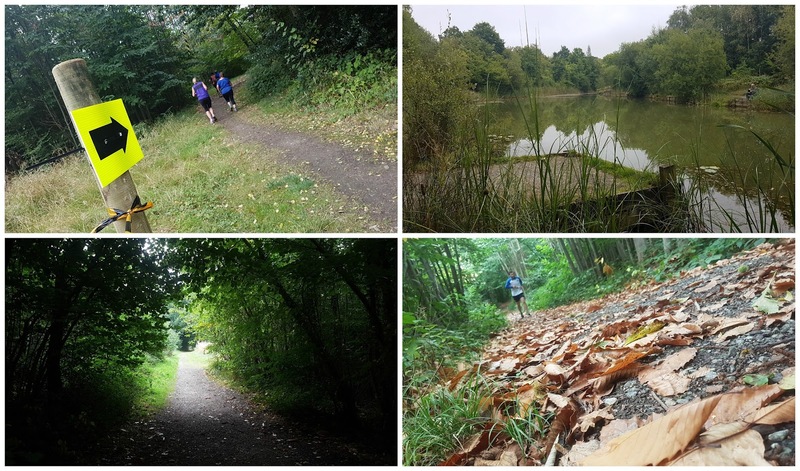 It's going to be impossible to describe each and every detail of the course, but we were mostly running on dirt paths which were soft but not muddy as it had been fairly dry in the weeks leading up to the race. They twisted and turned all over the woods and featured plenty of climbs and descents, uneven terrain and tree roots. I had a few hairy moments were I almost lost my footing on uneven ground, but that's what trail races are all about. The route itself had been marked out very well with arrows and plenty of taping, plus there were just about the right amount of marshals dotted around. There was also a fantastic photographer capturing the event and she has kindly allowed me to use some of her photos on the blog, so a big thanks to Dawn Granger for that. As for my race, I started towards the front of the field and mingled into the pack until it started to naturally thin out. A couple of faster runners shot off way into the distance and I didn't see them again until the end. After about a mile I moved up into third position and spent the next few miles thoroughly enjoying everything that the woods threw at me. At just over halfway through I could sense that someone was gaining on me, but I kept pushing and managed to stay a few steps in front. Within the last mile I started to develop a stitch which I could feel impacting on my pace. On a hill with about 400 metres left to go I finally could not hold on any longer and slipped back into fourth position. At the time I hadn't realised exactly how close we were to the end and I had hoped I might have enough time to fight to regain the place once we were back on flat ground, but as I turned the corner at the top of the hill I recognised the lake and knew that we were already at the finish. It was a good battle but it's never nice to be on the losing side! What can I say about the race? The course was brilliant and it was really well marked out so credit must go to the organisers (largely made up of the core team from Shorne Woods parkrun) for getting this spot on. 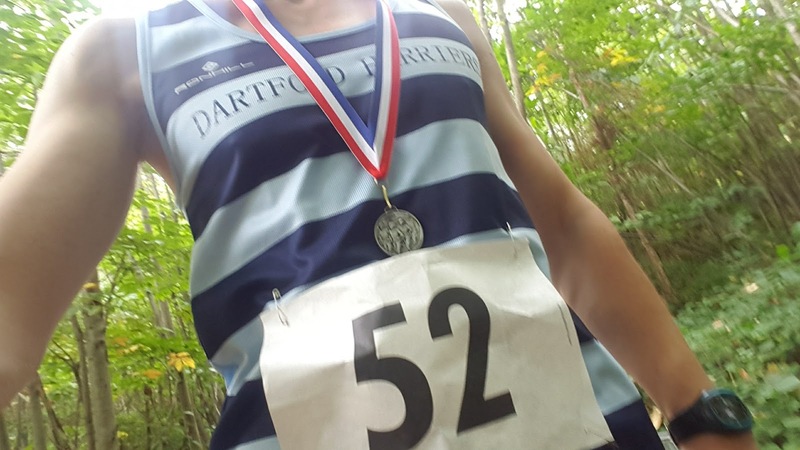 Given that this race had no chip timing, no post-race freebies (there was a post-race massage tent but I'm not sure if this was free) and a fairly standard generic finishers' medal I'd say that it was a tad overpriced. I know that the money is going to a good place but I think runners would generally expect chip timing and at least a banana and a bottle of water at the end for £15. Plus it'd be nice to have the results recorded online in a place that felt a bit more permanent than the uploaded spreadsheet document. I'm sure the details will be looked at and if the race returns in 2017 I'd like to be on the start line again because it really is a fantastic race through the woods.